The GEMS Camp UAE | for UAE Girls Only! 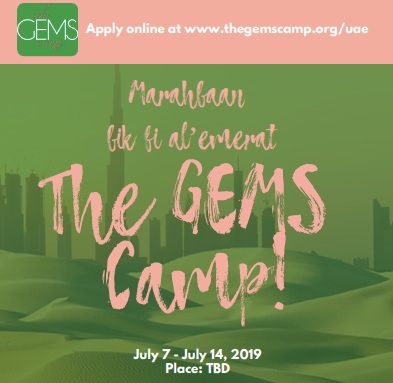 Introducing Girls interested in Engineering, Mathematics, and Science - The GEMS Camp - to the UAE! The mission of The GEMS Camp is to build confidence in teen girls in 5 core areas - Academics, Career, Creativity, Leadership, and Service - so that they will be successful in STEM studies and careers. The deadline to apply is March 31, 2019 (12am Gulf time). We are searching for 45 middle school girls to participate in our summer program. You must be entering grade 7, 8, or 9 for the 2019-2020 school year. Ready to shine? Begin your application by clicking below. Nowadays, finding exceptional young ladies is rare. But we go through the process of finding the most exquisite college and high school female students who live out the principles taught at The GEMS Camp. This essential group of young ladies we call our “diamonds and rubies” are the band between instruction and relationships girls receive at The GEMS Camp by providing transparency, encouragement, and academic support. We invite you to let your line shine with us by applying to our 5K leadership program. You have questions? We have answers. View our online brochure to learn more about the program. University and high school students can read more about general volunteer responsibilities and desired qualities we seek. 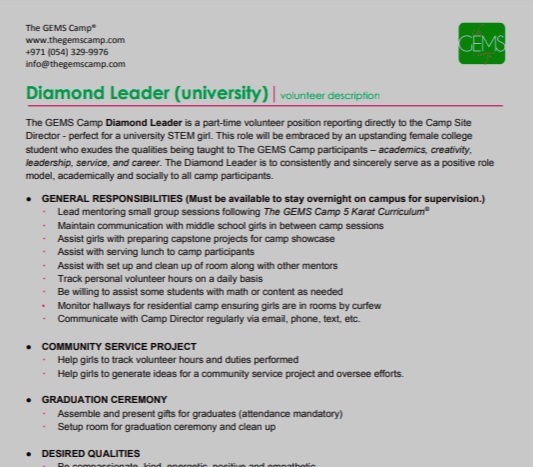 2010–2018 © The GEMS Camp, All Rights Reserved.